One of the main reasons the APS™ is in existence is so the public can determine if their current or potential advisors, who proclaim to have a specialty regarding asset protection, are both competent and ethical. Until now, there has been NO system of review or ranking in the asset protection area. The APS™ has changed all that. There are many different types of advisors who can provide help to their clients on the topic of asset protection. Most clients think of attorneys as the only type of advisors who can/should help them with asset protection. You’ll be interested to know that most of the advisors “pitching” asset protection to clients are NOT attorneys but instead are non-licensed advisors, insurance/financial planners or CPAs/EA/accountants. The APS™ rating system takes into account the fact that different advisors provide different advice. The APS™ rating system is flexible enough to rate all types of advisors including attorneys, CPAs/EA/accountants, financial planners, securities licensed advisors, insurance agents, mortgage brokers, real estate agents, and “others. The fact of the matter is that not all clients need a $500 an hour attorney to help them with their planning. Some clients might not even need an attorney at all, while others may need to go find the “best” trained attorney in their area or even the country. No matter which level or type of advisor you are, the APS™ rating system will help your clients understand that you do have unique knowledge (on one or more levels) on the topic of asset protection. This will help you brand yourself as a unique advisor and show your clients that you are not only knowledgeable but are also dedicated to protecting the public by being a part of a public education/watch-dog Society. The “AAA” rating from the APS™ is the highest rating an advisor can obtain. This rating can only be given to attorneys who draft legal documents. A Level “AAA” rating means that an attorney has submitted, for review to the APS™ education board, the legal documents they use when forming legal structures for clients. An additional requirement to receipt of a Level “AAA” rating, the advisor must pass a comprehensive essay exam or conduct a comprehensive conference call with at least one educational board member who performs an oral exam to determine if the attorney has the requisite knowledge and experience to warrant a Level “AAA” rating. The Level “AA” rating is for advisors of all kinds who know domestic asset protection planning, but do not draft legal documents. In order to receive a Level “AA” Rating, the advisor must prove to the APS™ Board that they have sufficient knowledge to provide competent advice to clients when it comes to protecting their wealth. The easiest way to prove to the APS™ Board that an advisor has sufficient knowledge is to become certified by an educational entity which deals with asset protection. The only current educational institute which provides such education is The Wealth Preservation Institute through its CWPP™ and CAPP™ designations. 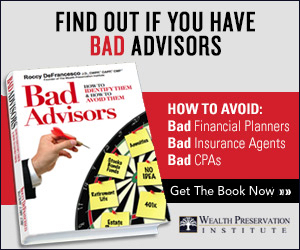 For advisors who do not have the CWPP™ or CAPP™ designation (which requires advisors to pass a multiple choice and essay exam), they must pass a comprehensive essay exam or submit to a comprehensive conference call with at least one educational board member who performs an oral exam to determine if the advisor has the requisite knowledge and experience to warrant a Level “AA” rating. Level “A” rating is for advisors who have a basic knowledge on asset protection planning but cannot provide complete advice to a client without a backup support team. Why would you want this rating? Ask yourself this. Would your clients rather work with an attorney, insurance advisor, CPA/accountant/EA, or financial planner who had a basic working knowledge of asset protection, but does not consider themselves proficient to draw up a complete plan, or one that knows nothing about asset protection planning? To receive a Level “A” Rating, the advisor must pass an essay exam complete an oral examination by an educational board member. Most asset protection “gurus” who really do know their AP Planning, focus on core domestic or offshore asset protection tools like Limited Liability Companies (LLCs) as well as Offshore Asset Protection Trusts (OAPTs). The APS™ was created to make the public aware of ALL of the creditors (like the IRS via income, capital gains and estate taxes, downturns in the stock market and long term care costs) who can take their money/assets and list the advisors who can help protect ALL such creditors. Advisors can obtain a Level AAA, AA, or A rating, but can not receive “G” rating if they are not proficient or knowledgeable in the area of “Global” planning. Most asset protection planners are proficient in using domestic structures to protect a client’s wealth. As readers will find out, one of the best asset protection plans for liquid dollars (stocks, mutual funds, etc) of many clients is an Offshore Asset Protection Trusts (OAPT). Advisors can obtain a Level AAA, AA, or A rating, but if can not receive an “O” rating if they are not proficient or knowledgeable in the area of offshore planning. To help you understand our ratings, we have included some examples. 1) John Smith, J.D.—Attorney Smith drafts domestic LLCs and OAPTs. He is not familiar with life insurance or annuities. His rating is “AAA-O.” Why? Because he knows how to draft legal documents to help clients with core asset protection and also knows offshore asset protection. He does not receive a G after his name because he is not familiar with “other” asset protection topics. 2) Same as 1) except Attorney Smith also has a working knowledge with life insurance, annuities, capital gains tax, income and estate tax reduction planning. 3) Insurance advisor who has taken the CAPP™ or CWPP™ certification courses. His/her rating is “AA-O-G.” Why? Because this advisor has taken an education course which teaches global asset protection and offshore asset protection. This advisor can put together a complete asset protection plan for clients. The plan will have some parts that need to be implemented by a practicing attorney and some parts the advisor can implement and therefore the advisor receives a “AA-O-G” rating which is the best rating a non-licensed attorney can receive. 4) CPA/accountant/EA who has a working knowledge of basic asset protection but is not ready to make recommendations on a complete asset protection plan for a client. The advisor might have read several books on asset protection, but has not been through a certification course. This advisor knows much more about asset protection than the average advisor who knows NOTHING about asset protection. If you have any questions about the above ratings, please contact the APS™ at Email Us.